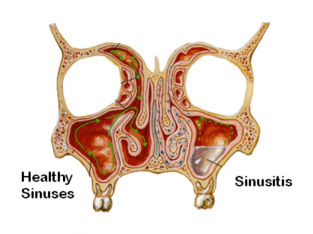 Before determining your options for sinusitis treatment or surgery, it is important to understand the anatomy of the sinuses and the cycle leading to chronic sinusitis including the common causes and symptoms. Our sinuses are the air-filled spaces in the bones of the face and skull that act as the body’s natural air filter. 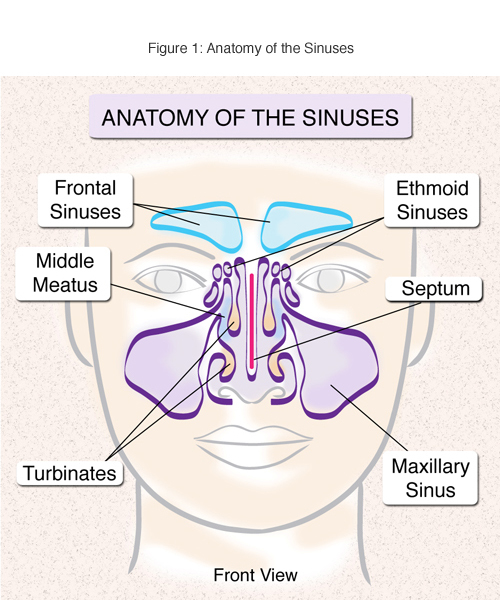 There are usually four sinuses present on each side. The thin layer of mucus they produce is normally propelled by the cilia, the microscopic pulsating hair cells that line the nose and sinuses. The healthy mucus thereby flows freely into the nose and is designed to moisten the air we breathe, as well as trap and remove inhaled pollutants such as dust, mold, viruses and bacteria that we breathe in. Normally, this thin “mucus blanket” drains unnoticed into the throat and stomach, removing the trapped pollutants and preventing potential infection. When the passages between the nose and sinuses become blocked, often by a combination of infection, inflammation and often by nasal polyps, the mucus cannot drain properly. Instead, it backs up and becomes trapped in the nasal and sinus cavities, which can lead to sinus infection, also known as sinusitis. Fig 5: On the healthy left side the mucus is circulating normally (green arrows) thru the nose and sinuses taking breathed in contaminants with it into the stomach. These healthy sinuses are filled with air. On the sick right side, swelling has blocked the sinus passage into the nose leading to stagnation of the mucus and infection. Some people are born with narrow sinus outflow tracts which often contribute to repeated sinus infection, as can a deviated septum, nasal polyps and other nasal abnormalities. Typically, multiple factors are responsible for sinus problems. Sinusitis usually causes nasal stuffiness and a feeling of pressure or pain in the face and head. It often causes a thick discolored nasal discharge, cough, even severe asthma, pain in the upper teeth, bad breath, a generalized feeling of fatigue, feeling sick and loss of ability to taste and smell. The loss of smell — also called “anosmia” — should never be overlooked. Besides impacting daily life, anosmia can hurt your sense of taste, lead to potentially dangerous weight loss and reduce quality of life. Read more about Anosmia. If you are experiencing any or all of these symptoms, a doctor’s evaluation can help determine the underlying cause. Contact us today for an appointment in NYC. The doctor will also be able to recommend the best sinusitis treatment including sinus surgery in some cases if necessary.